If you are interested in learning about Tableau, following key bloggers is a good way to learn a lot of applied techniques quickly. In a recent blog post, I described how important it is to subscribe to bloggers that produce a significant amount of good content. In a sense, this blog post could be considered Part 2 of those thoughts. However, in this article I focus on who to follow, not how to follow them. 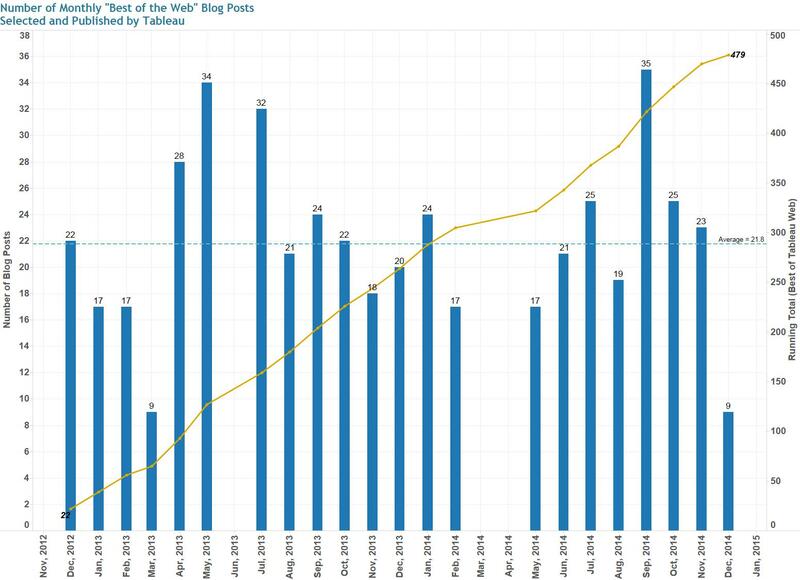 Although there are now more than a few hundred people blogging about Tableau (beginning of 2015), there are just over 100 bloggers that have been recognized by Tableau as having produced at least one article of excellent content since December, 2012, which is when the “Best of Tableau Web” series of selections began (Figure 1). Figure 1 – “Best of Tableau Web” selections (click to enlarge). These selections are made on a near-monthly basis by Tableau employees and published to their blog. By compiling and quantitatively analyzing these selections, it is possible to build a list of bloggers that can be followed to help you learn Tableau techniques more quickly. Which Bloggers Should You Follow? In compiling a list of bloggers on a particular topic such as Tableau software, it is never going to be possible include everyone worthy of mentioning because the field is constantly in flux and top future bloggers are just emerging. However, if you are going to start simple, you could choose to follow 10 reliable and established Tableau blogging sources. A good way to identify these bloggers might be to choose them based on their technical merit as judged by Tableau itself. 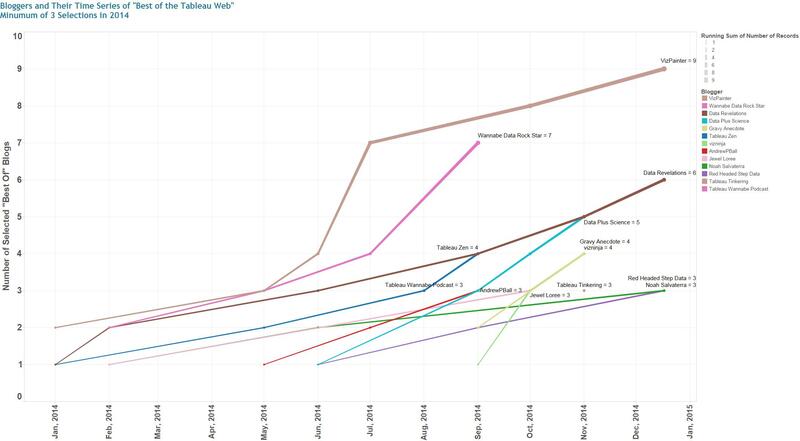 Figure 1 shows the top 10 bloggers that have received the most “Best of Tableau Web” selections since these selections began in December 2012. Notice that all of these bloggers have shown consistency over time in being selected for the “Best of Tableau Web” series. Figure 1 – The top 10 Tableau bloggers that have received the “Best of Tableau Web” selections (click to enlarge). To make this selected list, these bloggers have all created really good content over the time frame of consideration. There are two companies out of the top 10 bloggers (The Information Lab and Interworks) that consistently produce excellent blog posts. Their respective staffs have been doing creative work using Tableau and have consistently produced publication quality content. The remaining eight individuals have all been blogging for at least 1.5 years and have shown the ability to publish high-quality content over time. The list of the top 10 bloggers is shown in the color legend in Figure 1. The top two individual Tableau bloggers are Andy Kriebel of VizWiz and Russell Christopher of Tableau Love. Those guys are prolific Tableau bloggers and they have nearly matched the output of Interworks and the Information Lab all by themselves. The development of this amount of top-flight content on such a consistent basis shows that these two individuals are determined and focused on their blogging missions. Being selected that many times in the “Best of Web” series means that the work they are doing is excellent and goes beyond just applying Tableau in normal applications. By spending just a few minutes within their blogs makes you realize how passionate they are about Tableau. For ease of use, here are hyperlinks to the top 10 Tableau bloggers as shown in Figure 1. You should be able to subscribe to or follow these these blogs by using these links. Tableau has seen a rapid expansion of its user base and its “community” over the past couple of years. This growth has been exceptional and has produced a number of new high-quality bloggers. 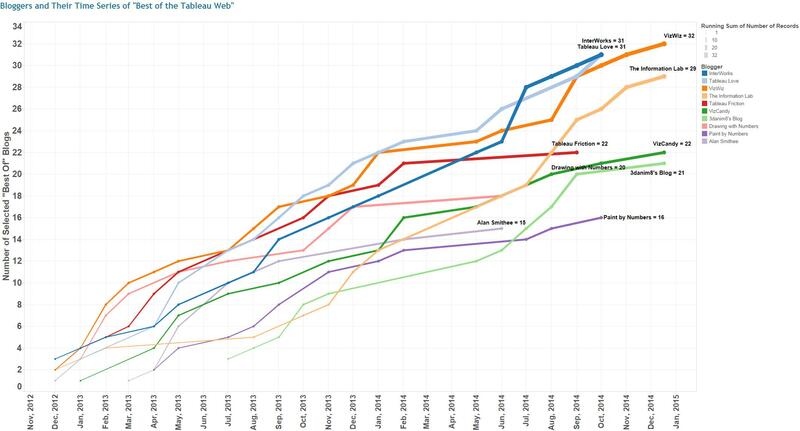 Figure 2 shows the 2014 time series histories of some of the rising Tableau blogging stars. The color legend shows the 13 people that have received at least three “Best of Tableau Web” selections during 2014. There are Tableau Zen Masters in this list as well as podcasters, Tableau employees and others that have great passion for Tableau. Following these people is a great idea for anyone interested in Tableau. Figure 2 – The bloggers that received at least 3 “Best of Tableau Web” selections in 2014 (click to enlarge). Links to these and all the other people that have received the “Best of Tableau Web” selections are available in this spreadsheet (click to download). There have been a total of 479 blog post selections made since December, 2012. For interactive dashboards of this data, click here. Besides following the previously mentioned Tableau Bloggers, there is another select group of individuals that may not be full-time bloggers, but they also dedicate a lot of their time to helping others. This group is known as Tableau Zen Masters. Some Zen Masters also write blogs but not all of them do. For a list of current Tableau Zen Masters, click here for the current Tableau Software Zen Master Web Page. You will never go wrong in following the work of a Zen Master by subscribing to their blogs or social media channels. These people were chosen as Zen Masters for many reasons and they represent the best proponents, teachers, and users of Tableau that exist anywhere. You can find links to their work on the Tableau webpage cited above. After completing this article, I performed a personal blog performance assessment. Click here if you would like to read about the results. Just wanted to thank you for providing such great posts; I gain benefit from each one. You are welcome. It is my pleasure to write this blog. Thank you and I appreciate your comment. A fine list, it’s amazing how much depth there is to this list of “best of” bloggers. Very well put together viz too, I enjoyed looking at it. Amazing that Andy and Christopher manage to keep pace with the leading pack, I know how much effort goes into a blog and to repeatedly be commended for their work is very impressive. Thanks for writing. I am working on another piece that goes into a self-evaluation of my blog. This post has a section in it where I go beyond the “Best of Tableau Web” numbers, so to speak. Be sure to check it out when it hits. I think you will like it :). The concept of this upcoming post woke me up at 5 am today and I had to get up to write the outline! Andy and Russell are simply blogging machines that produce great stuff. What else is there to say about them? Well you’ve peaked my interest so I’ll be on the lookout, nice one. You’re a bit of a blog machine these days yourself to be honest. Well, I have had a few weeks off of blogging and during that time, a blog-jam formed in my head! (hey, you heard it here first – it just came through my fingertips!) The only way I know how to clear the jam is by writing these posts. Thanks for taking the time to read them. Thanks for writing to me. I’m going to subscribe to your channel and learn some Tableau from your videos!